Being back in my childhood home is always an odd feeling. "Childhood home" isn't exactly right. I was nearly 12 when we moved into this house, so I guess this is more of my teen-age home. Still, much of my "coming of age" years happened here. It's the flashbacks that always get me. I had one today, just standing by the steps that go to the upstairs. Duncan was standing on the fourth brown-carpeted stair, and he reached out to hug my mother good-night. I was hit then with the memory of those brown stairs. That staircase faces the front door, and it seems like I used to always be sitting on the stairs, waiting for someone. I'd be all dressed and ready to go out, looking for someone's headlights to pull in the driveway. For just a second I remembered that amazing sense of anticipation that went with any night out. When you're 16 or 17 or 18, everything is an adventure. Anything might happen on any night. You might meet up with anyone; you never know who will be at what party or what the night holds. The ghosts of those years tend to hover quietly while I'm here. Sometimes I'll step on a certain rock and remember a night of breaking up, or hear pebbles crunching on the driveway and remember a hundred nights, sitting on the brown steps, waiting. At the end of the long, long road that leads from Tennessee to upstate New York, there is a big white house on a big gray-blue lake. The reward of 14.5 hours in the van with three kids, my niece, my brother (her dad), and the dog is the next day: a whole day spent doing absolutely nothing but lounging by and in Seneca Lake. Oh yeah--I also had a nap. Some of the crew went sailing and canoeing, but that was too strenuous for me. Now everyone is tired and will certainly sleep well tonight. There's nothing like a day of water and the particular lullaby of the lapping waves of lake against shore to give one the deepest of sleeps. "He said the pleasantest manner of spending a hot July day was lying from morning till evening on a bank of heath in the middle of the moors, with the bees humming dreamily about among the bloom, and the larks singing high up overhead, and the blue sky and bright sun shining steadily and cloudlessly" (Emily Bronte, Wuthering Heights). I'm not giving up on summer yet. I still have a week's vacation coming up on Seneca Lake in my hometown in New York, and then the promise of plenty of fun in August. But below are snippets from just a few of my favorite summer activities thus far. More, I'm sure, are yet to come. It's VBS week at SmallWorld. I have been at our church for seven summers now, and I've dreaded VBS for the past six summers. Our church used to be a swamp of tension, misunderstandings, and assumptions that followed a 6-month cycle. Seems like every July, things would come to a head and the ugliness that folks were bottling up would come pouring out right around VBS time (which usually comes within a week of our quarterly congregational meeting). The kids were having fun; the adults were forcing smiles and avoiding eye contact. All kinds of behind-the-scenes drama was going on that left me with a burning in my stomach, a hole in my heart, and a clenched fist. For the first time ever, I am enjoying the blessing of VBS. I'm not walking on eggshells. Our church has gone through much ugliness in the time we've been there. We have wanted to leave so many times. I've blogged about that before, so I won't go into it here. The point is...now the air is clear. In Sunday School we've been studying prayer, and this month we are focusing on prayers for the church as found in Ephesians. Yesterday we talked about God's “incomparably great power” and how we've seen it in our lives. There were many times that I could not have imagined our church ever reaching this point. All that dirty laundry and toxic talk. All that completely un-Christ-like behavior that is so particular to Christians. But I have seen God's mighty power at work in our congregation, and it is a wonder to be a part of that. The healing has come through many sources: through an interim minister who wasn't afraid to reproach our wrongdoing, through an elder who wasn't afraid to show his brokenness, and our new minister, who is like this amazing gift at the end of a long journey. Through my husband, who says things to me like, "I can't be frustrated about the situation. I don't know enough about it." (How unlike me, who gets worked up about issues before I know the whole story.) And on a personal level, the healing has to do with God's working inside of me--a letting go of bitterness, injustice and rage; an attitude of patience and waiting; a calming. Lots of specific, directed prayer. "The odor of sweat rises/when you do/under the armpits,/the owner's particular smell/you can never quite wash out." Great stuff. Reprinted from "River Styx," No. 32, 1990, by permission of the author, whose most recent book is "Substantial Holdings," Pudding House Publications, 2002. Poem copyright (c) 1990 by Marsha Truman Cooper. What always strikes me most about being in upstate New York is how little things change here. Stereotypes dictate that back home in Blount County, Tennessee, you'd find a slow-paced life. Rural. Appalachain. Folks up here think that Southerners are hillbillies. When I went away to college in TN, my NY friends joked about me going to a place without electricity. Truth is, hardly a thing has changed since I left for college 22 years ago. In my hometown, there is a new hotel and two new subdivisions. (Back in Blount County, subdivisions go up faster than I can read a book.) A new middle school has been built. Downtown looks cleaner and nicer, but that clean-up was already in progress back when I was a kid. Most of my friends' parents still live in the same houses, and most of my high-school friends still live within 25 miles of Geneva. This morning's drive to church is one I've made hundreds of times in my life. My parents go to church in Ithaca now, where my oldest brother has lived for over 30 years. We made that hour drive weekly for years. I know every house, every curve in the road. And nothing has changed. Every little town along the way has its picturesque streetfronts of huge Victorian houses, with 3-side front porches and widow's watches on the roof, facing out to the lake. There are no fast-food restaurants in the 60 miles between here and there. Never have been. No new subdivisions, although an old Victorian or two have been converted into B&Bs. Still the same cornfields and soybeans, and even a few Amish in horse-and-buggies coming home from Sunday services. In Blount County, Tennessee, we're struggling to keep the rural feeling of the area--to preserve the unbelievable natural beauty--while "progress" proceeds at breakneck speed. And here in New York, a state with a reputation of being cutting-edge and first in everything, nothing's changed at all. I don't know what it all means. I'll take the gentleness of the South over the raw edges of New York anyday. But I could stand one less Walmart, one less subdivision with monstrous houses, and a day in the mountains. And so summer swim team comes to an end. Our introduction into the world of the Flying Dolphins has been fantastic. As Dr. Hibiscus blogged earlier today, we are huge proponents of swimming. One of the first things my parents did when we moved from Southern Illinois to NY, when I was 18-months-old, was to join the Yacht Club Having been in a sea of cornfields and fruit trees for two decades, I guess they figured they’d try something new. They took sailing lessons and bought a motorboat. My brother Stephen and I swam every day at the Yacht Club while our older brothers sailed and skied. 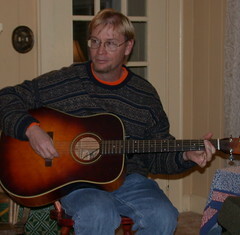 In the winters, I took lessons at the YMCA and later at the local college. Swim lessons in the dead of winter in upstate New York are not fun. College pools are notoriously cold, and hair freezes quickly while you wait for your dad to pick you up. Nonetheless, I continued swimming lessons for years and years and picked up sailing lessons in 4th or 5th grade. When I was in sixth grade, we moved from our house on Castle Street to our newly built house on Seneca Lake. From late May until September, we spent our days in the water. By this time we were all proficient sailors, and our little Sunfish knew the waters well and miraculously survived for many years. There’s nothing like a boat full of giggling girls on a hot summer afternoon except for a boat overflowing with boisterous boys. My friends and I were all about getting a tan; my brother and his friends had a different goal. They called it “skiddling”: standing on the nose of the boat to see how far you can “submarine it” into the water. Another favorite was to capsize the boat over and over. Like I said, we were all proficient sailors. Swimming started in earnest in seventh grade. At a routine doctor’s visit, my pediatrician noticed I was showing signs of scoliosis. My curvature was nearly severe enough for the dreaded back brace. He suggested I join swim team, and so I joined my school’s junior varsity team. Within six months, my curve lessened by 15 degrees, and within a year, it was down to 6 degrees. When I read nowadays that swimming is the ultimate exercise, I believe it—with good reason. So my swimming continued through high school. We called ourselves the Pink Panthers (our school was the Geneva Panthers) and my relay team even made it to Regionals once. I loved almost every second of it, except for the practices. (Who loves swimming laps and sprinting for 2 hours straight?) But even practices were fun because of the joy of friendships. I miss swimming. Like Randy said, though, it’s been fabulous to relive our swimming days through our daughter. I look forward to many more summers of the Flying Dolphins. I have to say that blogging has helped me tremendously to write every day (or nearly every day). When I was in graduate school, I wrote every chance I could get. When I wasn't writing, I was thinking about writing, turning phrases and choosing just the right word. The eloquence of language was always at the tip of my mind's tongue--how some words are solid and others liquid, some smooth and some crisp. The feeling of just the perfect combination of words--the immediate need to write that phrase, to capture it before it vanishes. I see words--feel words--like others see the way a picture should look on a wall, or how a tree needs pruned just in a certain place. In the years that I've been homeschooling, I've put writing aside. I have an unfinished collection of poetry. 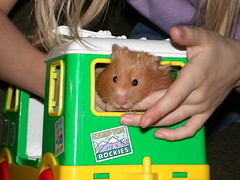 I have other writing projects I sometimes yearn to begin but must stow away in the "someday" category. For now, I am enjoying this strange world of blogging. I am challenged by my friends, who write well and think deeply. They keep me on my toes. July 16, 2006: Am I a tomboy? Now this is a funny quiz. I think the questions that define one's "girlhood" are hysterical! What a riot that I am a tomboy because I don't get a manicure each week and love to go camping! I bet not one of my friends would even come close to being more girly than 30%, except maybe Sheila. You ignore gender roles and like to do things your way. So this summer I've implemented a chore system that is working well so far. I made an extensive list of specific chores that need done around the house. These are things that aren't part of the regular cleaning routine, but rather those kinds of deep-cleaning items that always get shoved to the end of the list. Some of these include: clean a kitchen drawer, bathroom drawer, kitchen cabinet, dining room baseboards, living room baseboards, a window; clean in your own room, in the sunroom, in the playroom; iron one shirt, etc. I cut these into slips of paper. We have 12 kitchen drawers, so I made 12 slips that say, "Clean a kitchen drawer"; similarly, I made the number of slips for the number of cabinets, etc. Ironing and window washing are endless, so I just made a bunch of these. I then put these into a bowl, and every day the kids and I each draw one and then go off to do our assigned chore. I've had to provide guidance for them and work side-by-side with Duncan, but they are doing a great job. For me, this accomplishes two things: one, some of these nit-picky cleaning chores are getting done; and two, the kids are learning new cleaning skills and helping out more around the house. Saturday was my niece April's wedding. 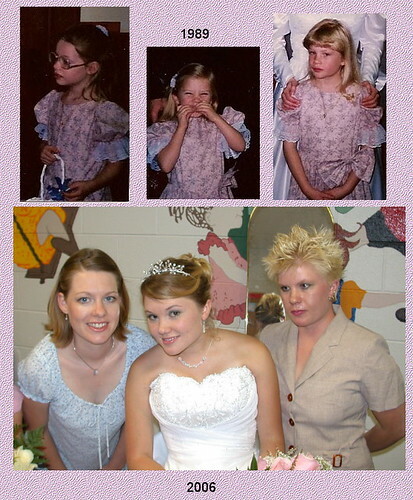 There is something heartbreakingly beautiful about my nieces as brides, and my daughter as a flower girl. 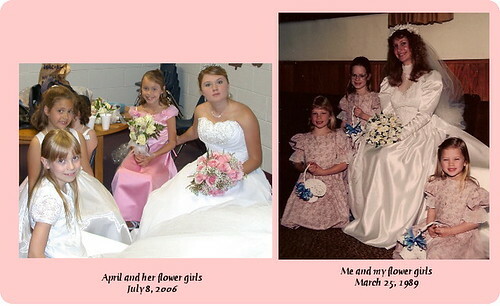 My three nieces were my flower girls 17 years ago, and Laurel has been a flower girl at two of her cousins' weddings so far. I can see the little flower girl in the bride, and, even more heartbreakingly beautiful, the bride in my own little flower girl daughter. These girls have been part of my life since I was 14. Esther—the spikey one on the right—was, indisputably, my favorite for many years. (I was too young to know that we aren’t supposed to pick favorites.) She always had such a large dose of personality. She danced at my concert band concerts. She ate candy bars until she threw up. She beheaded my Barbie dolls and colored faces on my paper dolls. I loved her anyway. Ellen (on the left, my brother Peter’s girl) was born a year-and-a-half later and was a little adult from the beginning. She always lurked at the adult table. She would rather be ignored at the adult table than have to play with the other kids. But I loved her anyway, because she was sweet and shy and thought I was the best thing in the world. She has turned into a graceful woman. Laurel was her flower girl two years ago. April (Esther’s sister) was the baby of the trio of girls. She was a scrawny baby who cried for the first 6 months and then, overnight, turned into this unbelievably gorgeous, smiling baby. She’s never stopped smiling since then. The passage of time seems most clear when I see these three girls. Here they are, in their own lives, in what seems to be a speed-of-light, fast-forward sort of phenomenon. They were little kids for soooo long, and now they are just these grown-ups. Makes me ponder, of course, those words of caution we parents have heard a hundred times from older folks: “Enjoy them now! They grow up so fast!” Inside I always roll my eyes and say, “Yeah, yeah, yeah…” But yeah. Yeah, they do grow up. July 7, 2006: I like this quiz! How funny is this? Is this not so SmallWorld? Except I'm really not an unschooler...but I guess it's all relative! "Watch out! We don't know what this one is!" "No, John, point it in the other direction!" "Are you sure that one doesn't shoot out?" And my favorite, "Duck! It's coming your way!" This afternoon we'll head over to my brother John's in New Market for our annual Cummins Family Fireworks. It's always an exciting experience. "Caution" is not something in my brother's vocabulary. And somehow he always infects my brother Peter, who is normally a rather cautious person. The two of them are transported back to their childhood, when no one cared about such things as getting blown up by bottle rockets. It is not at all uncommon to hear someone screaming, "DUCK!!!" as a mis-aimed, flaming object come hurtling toward the spectators on the deck. It's best to carry a fire extinguisher at all times. I like this website. Nice Fourth of July tour of the U.S.
Because there is a scratching, scratching, scratching low on the door of the sunporch. I know what it is. It's not that I'm scared it's a burglar or any such thing. It's that darned hamster. I remember now that Duncan was playing quietly on the sunporch for quite some time today, and apparently he was doing the forbidden: playing with the hamster (and thus leaving the cage door open). This is a lovely picture: My parents, after working in the yard all morning, take a rest on the bench under the dogwood tree. Duncan, barefoot and still in his pajamas at nearly noon, takes two cups of water out to his grandparents. I watch the scene from the window. Mom and Dad smile and reach out to Duncan, then gesture for him to sit between them on the bench. He joins them for a few minutes and then is off running, always smiling. Fireworks Part 1: We load into the van at 9:45 p.m., drive across the street to the subdivision, set our chairs up on the side of the road, and watch the fireworks from the park a mile down the road. We're back home by 10:15. The kids are happy--they've seen fireworks and know that more are yet to come. Fireworks Part 2 come on the actual 4th of July, when we drive out to Uncle John's in the tiny town of New Market, Tennessee. As if ducking to avoid being hit by one of Uncle John's badly aimed bottle rockets wasn't exciting enough for us, the neighbors have a spectacular display of fireworks each year. Seriously, these fireworks are amazing! Tonight there was a community church choir service at the amphitheater. The Greenbelt was comfortably packed. Plenty of room to stretch out and watch the kids play tag. Just the right kind of event for my parents, who are here for a week. During one part of the service, the orchestra played the songs from the various branches of the military and asked the veterans to stand. As always, I am honored to be next to my father, a veteran of WWII and Korea. "There aren't many old guys out here," he remarks. What goes through his head when he stands? Does he have flashes of war scenes, or is he thinking about the book he's just put down? The kids are in bed, and Randy and Jesse are away at Boy Scout camp. My latest book beckons me. More celebrating to do later this week. July 1, 2006: What kind of American English do you speak? What is the plural of "you"? How do you say words that end in "ary" (e.g., elementary, documentary)? How do you say this name: "Sheila"? What is Bigfoot's other name? How do you give directions? 1. Say, "It's over by where the old Walmart used to be, turn by the old Texaco, and go up to what used to be a stop sign but is now a red light. Or is it still a stop sign?" 2. Say, "Take a left at the stop light and go 1.3 miles." 3. Say, "Go north for 1 mile, turn west, and then north at intersection." 4. Say, "Go a ways to the brick house with the birdbath in front and the nice flower bed, then turn left and go about 3 houses. We're the ones with the dirt pile in the front yard." 1. I done did it. 3. I done done did it. If you take this quiz and score the same as I do, you may possibly be a Yankee! If you take this quiz and score the same as Randy does, you may possibly be Midwestern! If you take this quiz and flunk, you are probably dialectically and regionally confused. Welcome to the melting pot!